You might not know that, but Gimp comes with a number of pretty cool filters/actions and a realistic looking coffee stain is one of them. After a while I decided to make a new tutorial for all you awesome Gimp users out there. This time we are going to turn on the Xenon headlights on a random car. Enjoy! Neat little trick to create a fake gradient image with Gimp, from a random photo which you can than use as a website background. Lots of people think using a layer mask is only for the advanced Gimp users, fortunately this isn't the case at all. Let me explain you the basic usage of layer mask on a easy to follow step-by-step example. 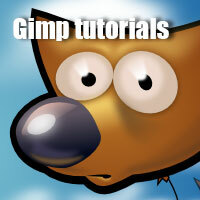 A slightly advanced Gimp tutorial, but still appropriate for the beginners as well. We will replace the fox's head with the head of a hamster. Fun Gimp tutorial for beginners where we achieve a perfectly symmetric face by using only one side of the face. Watermarks are a great way to protect your photographs if you don't want other people misusing them. We will create a simple but effective text and turn into a Gimp brush so you will be able to stamp your work. Knowing how to select parts of your Gimp documents with the help of Quick Mask might be one of the first things you should learn when starting with Gimp. Let me introduce you to the basics of Quick Mask. Pretty nice looking and simple to create effect, where we turn everything into pixels except the selected part. My car will end up looking like it's trying to escape out of the pixelated background. Light leak effects have become quite popular lately, especially on phone apps with photo filters. This time I will show you how to create a simple light leak to a photo from scratch, using Gimp. We will recreate the so called tilt-shift effect and turn a normal photo into a photo that looks like a miniature, this time using Gimp. In this simple tutorial suitable for the Gimp beginners as well, we are going to manipulate a photograph of standing still car to make it look like it's passing by real fast. Let me show you how to achieve that Depth Of Field effect known from the photography using Gimp. With other words, how to make selected area of the photo sharp and the rest out of focus. Simple yet very useful Gimp tutorial where we make a detail or an object in a Photo bigger and more visible by resizing it and adding a white rounded square frame around it. In this Gimp tutorial I will show you how to add a folded paper texture to a photograph and how to add a simple and subtle vignette effect on top. Gimp has a nice feature that can come in handy on various occasions, let me show you the basic usage of guide lines or guides.